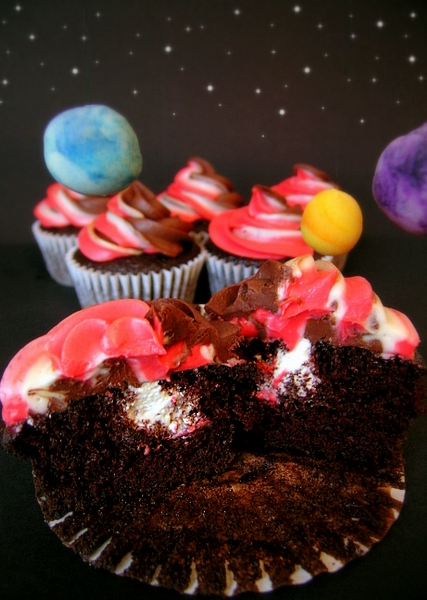 Jamie Anne of The Cupcake Review made Jupiter cupcakes for the National Geographic solar system cupcake contest. The cake is chocolate with a kick of cayenne pepper to represent the heat of Jupiter's core, and the center of the cupcake is filled with a soft whipped cream to represent the many layers of clouds on Jupiter. 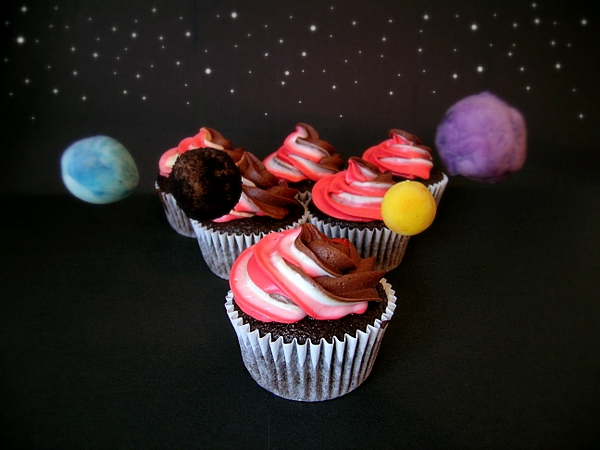 The frosting is a cream cheese/chocolate buttercream swirl in colors similar to Jupiter's. Hanging above the Jupiter cupcakes are the 4 Galilean moons of Europa, Ganymede, Io and Callisto, formed from homemade playdough. Visit The Cupcake Review for the recipes! Oh my goodness, how creative and fun!